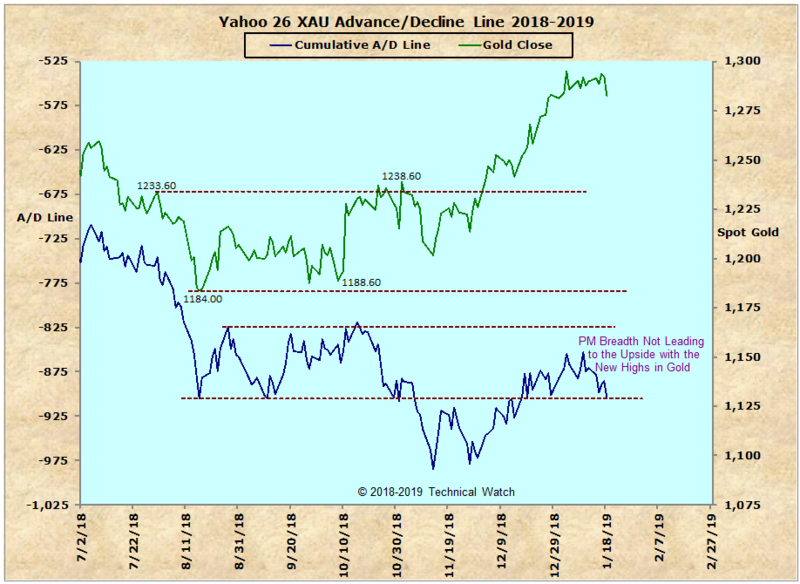 Current data suggests that an important top in gold is now behind us and that a multi week decline is in the offering as prices begin to play catch up to the acute bearish divergence seen in the chart below between the XAU/Yahoo advance/decline line and the price of gold. With the Precious Metals BPI staying in the 20's during this whole rally sequence since the November price lows, the Elliott Wave exercise that's been posted over the last several weeks on the BPI chart suggesting a corrective counter trend sequence is now complete, along with the Precious Metals McClellan Summation Index just recently being turned away from the +250 level, this now presents us with a high confidence indication to be short the metals complex at this time. The initial downside target for the price of gold will be anywhere from the $1250 level all the way down to $1225, but if interest rates move higher, deeper longer term downside targets will then be given. Next opportunity for a tradable low is now in early April.